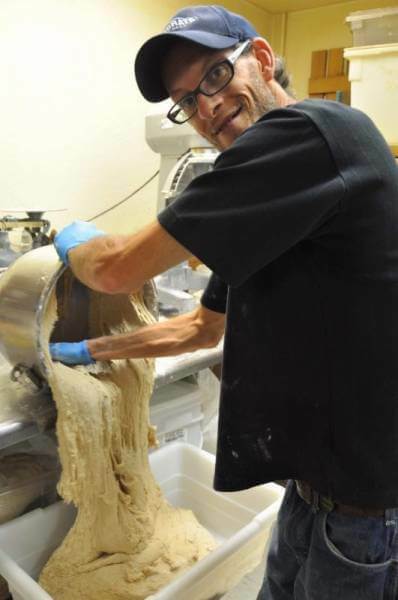 Shawn Saunders, pictured, makes fresh breads for Ranch Foods Direct daily. He recently began researching two traditional varieties of wheat — Einkorn and Emmer, also known as farro — that are among the first plants ever to be domesticated and cultivated. These much-sought-after but exceedingly rare grains are considered healthier than modern wheat varieties and easier to digest. This is especially important for those who are gluten sensitive or diabetic. Shawn purchases the grains in whole form from a farmer-owned cooperative and has them milled in a traditional stone grinder. The flours are then made into breads using real sourdough starter and no commercial yeast. “My customers are very excited about these new products,” Shawn notes. Get yours today at Ranch Foods Direct, along with other artisan breads, cinnamon rolls, muffins, dessert bars and more. To visit Shawn’s Facebook page, CLICK HERE.